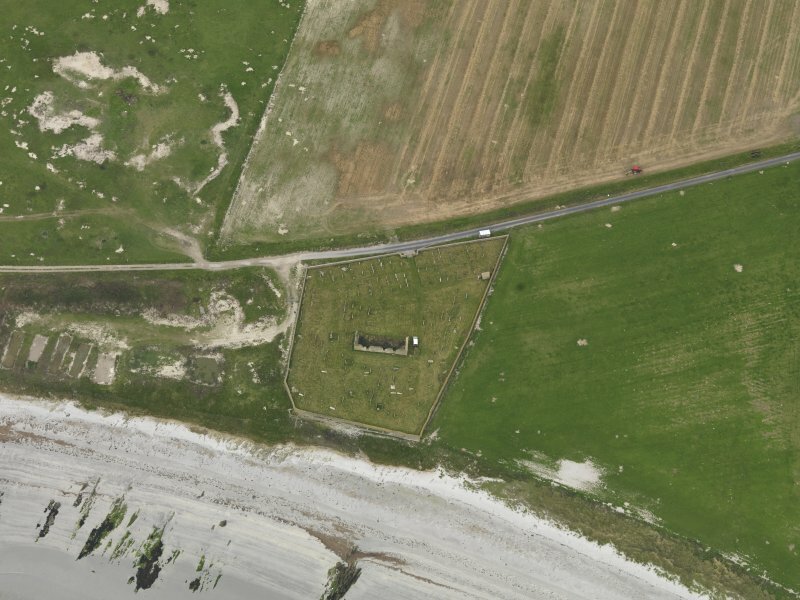 Oblique aerial view centred on the remains of the church, taken from the NE. 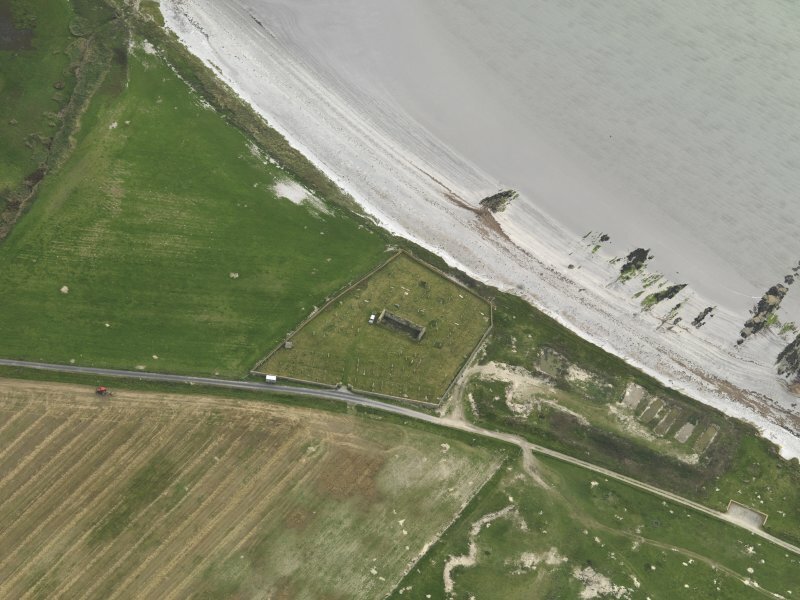 Oblique aerial view centred on the remains of the church, taken from the S.
Oblique aerial view centred on the remains of the church, taken from the WSW. 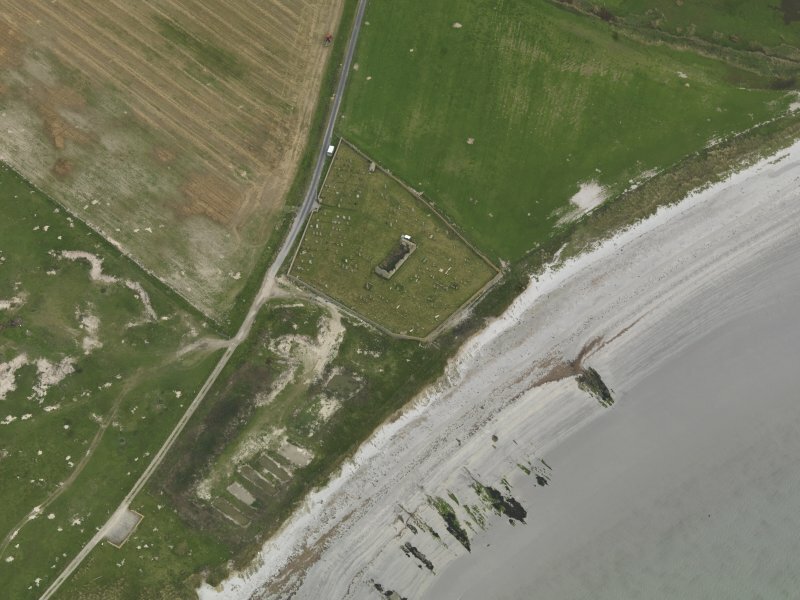 Oblique aerial view centred on the remains of the church, taken from the ENE. 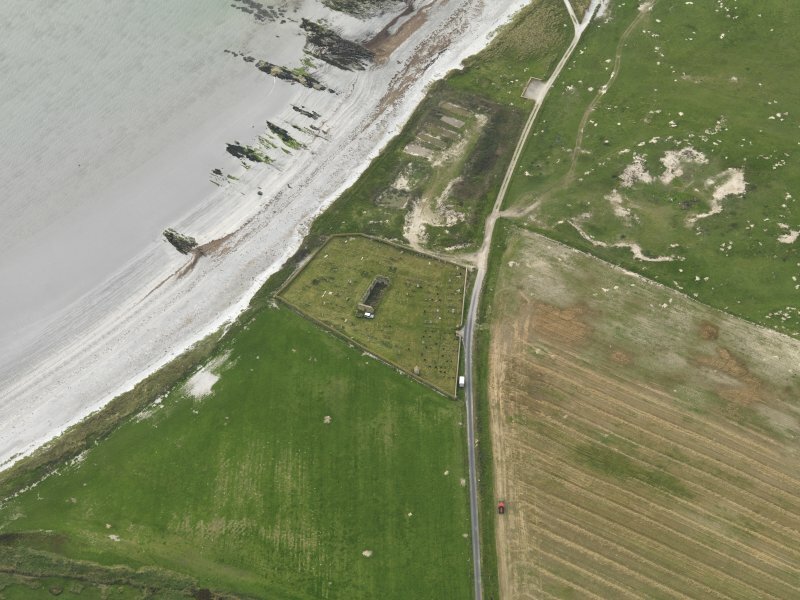 Oblique aerial view centred on the remains of the church, taken from the NNW. The ruins of the former church of Cross parish, built on a site formerly occupied by a prehistoric structure. The building which may date from the late 17th or early 18th centuries measures externally 60' 6" by 22' with walls about 2'9" in thickness the north wall being almost entirely destroyed. The others show that it has been plastered inside and harled outside. The graveyard was still in use in 1879. The nature of the prehistoric site is uncertain, but kitchen-midden deposits containing fragments of rude pottery are clearly visible along the face of the bank above the beach on the south side of the church-yard. RCAHMS 1946, visited 1928; Name Book 1879. The church is as described and planned by the RCAHMS, and the graveyard is still in use. According to Mr J D MacKay, the School-house, Sanday there was a pre-Reformation Chapel here dedicated to the Holy Cross, but there is now no trace. Possibly the present 17/18th century ruins incorporate fragments of the earlier church. A fragment of dry-stone walling and a few limpet shells exposed in the cliff face at HY 6540 3915 are all that remain of the prehistoric structure. Visited by OS(NKB) 9 July 1970. The ruins of the disused Cross parish church and cemetery lie adjacent to the coast edge, to the east side of Backaskail Bay. The building, which measures some 21m in length by 7m in width, is thought to date to the late 17th or early 18th C. This church is said to have been built on the foundations of a pre-reformation chapel, dedicated to the Holy Cross. A 16th C account mentions an earlier cemetery with outsize skeletons' being uncovered by erosion. Previous surveyors have noted the presence of midden deposits and drystone walling in the coastal section as indicative of an early settlement. 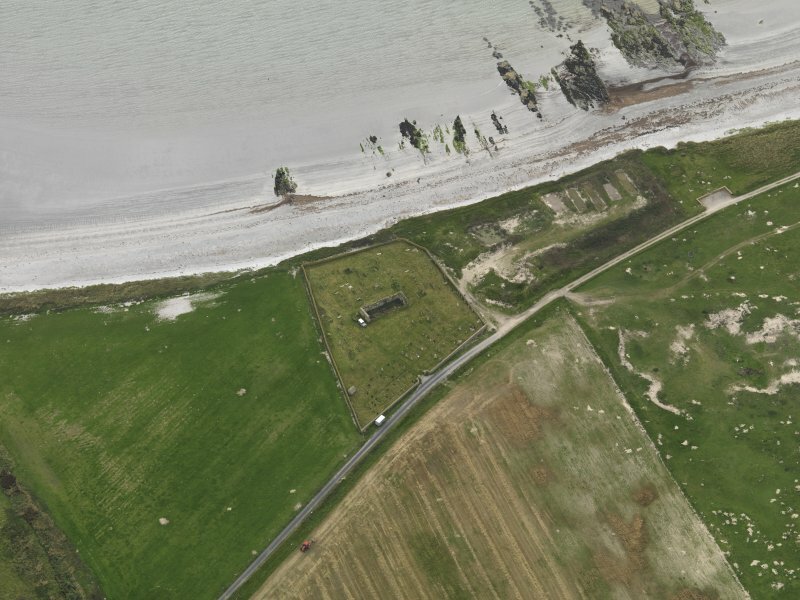 It has been suggested that the site may be of prehistoric date and that the location is also a likely one for a high status Norse settlement. The coastal section is protected by a sea wall which has been recently renewed and no eroding deposits were noted on this visit. There is a mounded area which extends from the eastern side of the cemetery which may represent archaeological remains, covered beneath a thick layer of blown sand. The mound measures some 40m in diameter and stands up to 2m high. 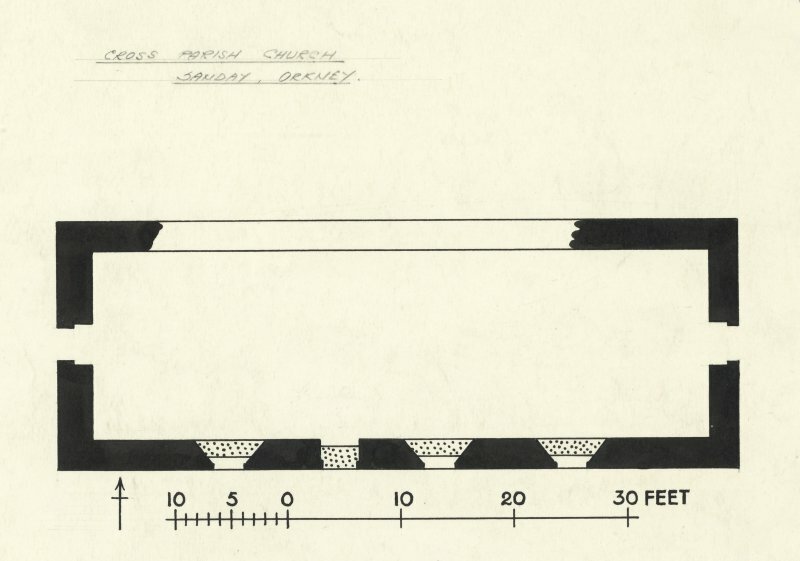 Earthworks, previously noted at the west side of the cemetery, have been tentatively identified as the remains of an early church enclosure or part of an earlier settlement. Ref. : RCAHMS (1946) #157; RCAHMS (1980) #174.